Costa Rica is SO Americanized that in San Jose I feel as if I’m in a Latin LA hood. It is also very safe for tourists, do not expect luxury (unless you go to a luxury 5 star resort but I guess then you wouldn’t be reading this post), do expect breathtaking nature. From the airport in San Jose, Costa Rica to your hostel or bus station you can take Uber. It will be around $10 and you DO NOT tip in Costa Rica. Uber is very cheap (compared to taxis) and convenient, just ride shotgun as it is still considered a “personal ride”. Tips and tax are included almost everywhere so no need to worry about leaving change. Ask for help with bus schedule at hotel/surf camp/hostel if you don’t speak Spanish. Bus stations in Costa Rica, although perfectly safe even for a tall blond solo female traveler, are busy and IN SPANISH ONLY and can be intimidating if you don’t speak the language. Buses don’t travel after dark so don’t expect many departures after 3pm for longer routes. The border between Costa Rica and Nicaragua you have to cross on foot. One bus drops you on one side of the border and then you hop on another bus on the other side once you’ve passed passport control and customs. Not hard, just takes ages to go through. Buses leave every 30min to an hour until 3 or 5pm (please check that day what the schedule is – changes daily) depending on your destination. At every bus stop and public place people are selling drinks (sugary sodas), snacks (double fried everything), socks, underwear, etc. It is done in a loud voice and although very cheap and some may say convenient, I found it the most annoying. (I do enjoy the fresh cut fruit though for C1000, yes I eat street food 😋} You will also encounter beggars. Not dangerous, just have the street smarts to know who to speak with and who to trust. 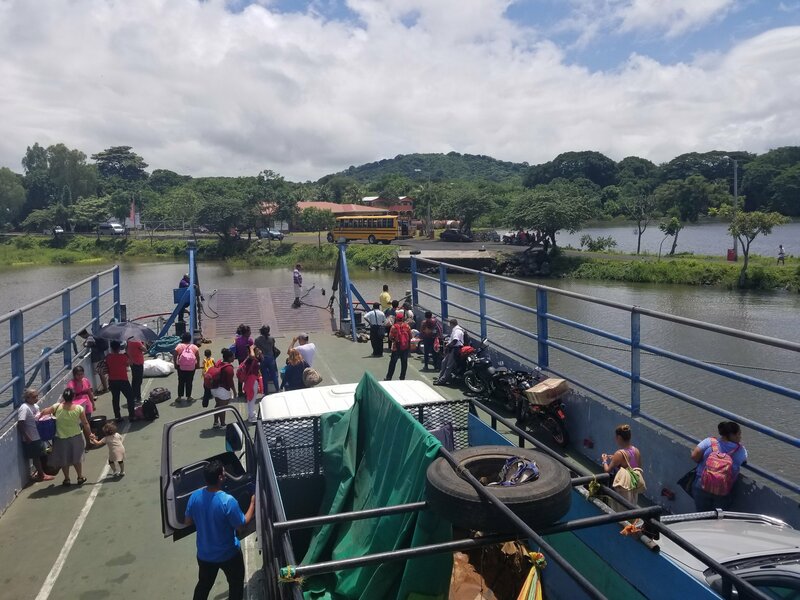 Using public transportation to get around in Costa Rica and Nicaragua is affordable, possible and safe, just very lengthy and annoyingly slow. After having done it once in this lifetime, I will resort to the speed and comfort of taxi, shuttle or rental car next time I visit Central America. In Nicaragua I’d hire a local guide/driver. Contact me if you need a reco, I had the perfect driver thru Rapture Surfcamps for a long weekend exploring parts of the country. That service is not much more expensive than renting a 4×4 vehicle with all its fees and insurances and will save you a lot of headaches with directions, haggling, bargaining, entrance fees, planning, etc. In Costa Rica I’d rent an SUV and drive around myself. You may not need the 4×4 function on the SUV but you’ll definitely need the clearance as per usual the roads to the best destinations are dirt 🙂 Costa Rica is expensive, I would say prices are equal to California, but at least you don’t have to haggle and you don’t feel like a walking $ where everyone is trying to make money off of you one way or another.